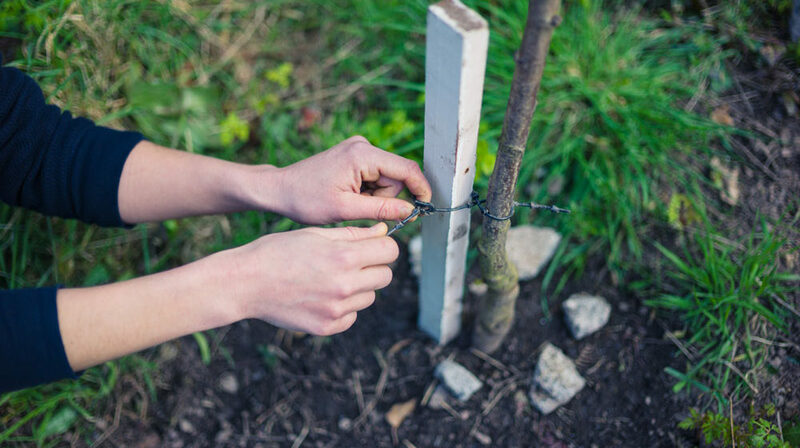 It’s a common homeowner question: should I stake my newly-planted young tree? Most trees do not need staking and are, in fact, compromised if they’re staked because they’re not forced to strengthen by standing on their own. A newly planted tree without stakes will sway slightly in the wind, and this movement causes it to grow stronger. A tree planted without stakes will develop strong roots as its trunk moves in the wind. It will also develop a natural taper. · Young trees with small root balls and a lot of foliage at their tops. They need the reinforcing that stakes provide. Determine if the tree needs a single stake or two or three stakes. Small trees with three-inch diameter trunks (or smaller) need one stake placed on the windward side of the tree. Bigger trees need either two stakes placed across from each other or three stakes arranged in a triangle. Next collect supplies and tools for the job: wooden stakes, webbing or polyethylene strips (or bicycle tire inner tubes or nylon stockings), a hammer, mallet, staple gun, and scissors. Attach a strap (made of webbing, polyethylene, inner tube, or stockings) to each stake by stapling it to the end of the stake. Arrange the straps around the tree, making sure they are twisted loosely around the trunk. Position the stakes so there is light tension on the straps. Finally drive the stakes into the ground to a depth of 18 inches. The above-ground portion of the stakes should be at least three feet tall. An incorrectly staked tree can suffer damage. Straps should not be wound tightly around a tree trunk. This can result in a ring of bark wearing off. A tree with a ring of exposed trunk can die because essential sugars are not able to travel through the bark from the ground to the leaves. Girding is the process of removing a ring of bark from a tree. A tree with a strap wrapped too tightly around an upper section of trunk can experience another problem: inconsistent tapering. The strap simulates the bottom of the trunk, so the tree thickens its trunk just above the strap. The flow of important nutrients is hampered by the abnormal trunk thickening. Stakes should not be considered permanent supports. For a young tree, do not leave stakes for longer than one year; stakes around larger trees should be removed after two years. To determine when stakes should be removed, gently push on the tree trunk. If the root ball does not move, the stakes may be taken out. Thanks to Lee Reich, Gary Johnson, and Davey Tree for material used in this article.